Obviously, Howie isn't going anywhere. 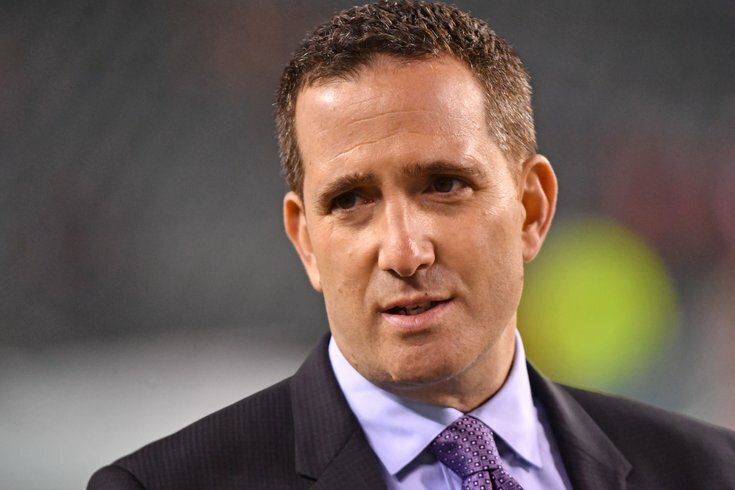 Everything that Howie Roseman touched during the 2017 offseason turned to gold, as a large number of players made major contributions to the Philadelphia Eagles' run to the Super Bowl. In 2018, there was bound to be some dropoff in front office performance (and there was), but overall it wasn't a bad year. Let's take a look back at the Eagles' last full calendar year, and revisit each noteworthy roster move, in our final "stay or go" entry of the series. • TE Brent Celek: Celek was scheduled to count for $5 million on the cap in 2018, $4 million of which they saved with his release. For what Celek was providing on the field vs. the money he was making, it was a no-brainer to release the long-time Eagle. Second-round draft pick Dallas Goedert was a clear and immediate upgrade over Celek, though Celek's veteran presence (or lack thereof this season) is hard to quantify. He announced his retirement in August. • DE Vinny Curry: Like the Celek release, this was a no-brainer based on production vs. pay. He was set to count for $11 million (!) on the cap in 2018. Curry played in 12 games (7 starts) for the Buccaneers in 2018. He had 21 tackles and 2.5 sacks. • LB Mychal Kendricks: Kendricks was set to count for $7.6 million against the salary cap in 2018. By releasing him, the Eagles saved $4.4 million. That was an easy decision, even before it was revealed that Kendricks would be pleading guilty to insider trading charges. To note, these aren't necessarily "roster moves," as these players all chose to leave in free agency. Certainly, the Eagles could have opted to overpay to retain one or more of them, but did not. They'll likely receive three compensatory picks -- a 4, and two 6's -- for those losses. • CB Patrick Robinson (4 years, $20 million, Saints): After a stellar season as the Eagles' slot corner, Robinson played in three games for the Saints before needing surgery to repair a broken ankle, ending his season. • DT Beau Allen (3 years, $15 million, Bucs): Allen played in 14 games, starting 8. He had an unproductive year statistically, posting 20 tackles, no sacks, and 2 tackles for loss. • TE Trey Burton (4 years, $32 million, Bears): Burton was OK in a starting role for the Bears, catching 54 passes for 569 yards and 6 TDs. The Eagles certainly couldn't afford him at $8 million per season to be a backup. • RB LeGarrette Blount (1 year, $2 million): Blount rushed 154 times for 418 yards (2.7 YPC) and 5 TDs. Those are obviously terrible stats, though I wonder if that would have been different in an Eagles uniform. The Birds certainly could have used the 2017 version of Blount. • LB Nigel Bradham: The Eagles locked up Bradham to a 5-year, $40 million deal, structured in an easy-out, team-friendly way. His re-signing quelled concerns of a perceived lack of depth at the position during the offseason. Bradham was a quiet early in the season, but he played better down the stretch. They'll need more from him in 2019. • RB Darren Sproles: After the 2018 NFL Draft came and went with the Eagles not selecting a running back with any of their five picks, the Eagles turned to a 35-year-old Sproles, who was coming back from an ACL tear. Sproles got hurt Week 1, and was day-to-day for the next three months. In 6 regular season games, Sproles had 29 carries for 120 yards (4.1 YPC) and 1 TD. He added 15 catches for 160 yards and 2 TDs. During the playoffs, Sproles had 16 carries for 25 yards (1.6 YPC), and 5 catches for 35 yards. The Eagles should not go down this path again in 2019. • S Corey Graham: Graham re-joined the team a few weeks into training camp. Everyone will remember his poor play against the Titans, but he wasn't awful on the whole in 2018. Still, he likely won't be back in 2019. With little room under the salary cap, the Eagles couldn't add bigger names like Alshon Jeffery last offseason, so they employed an "old guy strategy," in which they signed veterans on the wrong side of 30 to cheaper deals. This strategy paid major dividends in 2017. Not so much in 2018. • WR Mike Wallace: There was a solid argument to be made at the time of this signing that Wallace would be an upgrade on Smith. Unfortunately, Wallace broke his fibula Week 2 vs. the Bucs, and never appeared in another game. Wallace did not have any catches in his short Eagles career, though he did get open a few times with Nick Foles being unable to get him the football. • LB Corey Nelson: Nelson stunk during training camp and never made the 53-man roster. He cost the team $600,000 in dead money when they released him. • DT Haloti Ngata: At 34 years of age (he turned 35 in January), Ngata looked cooked for most of the season, though he did have a calf injury. • LB Paul Worrilow: Worrilow tore his ACL during OTAs. • TE Richard Rodgers: Rodgers had a good camp and preseason, but he injured his knee and missed the first nine games of the season, before being reactivated from injured reserve. He had 1 catch for 7 yards. • Acquired DE Michael Bennett and a seventh-round pick in the 2018 NFL Draft from the Seattle Seahawks in exchange for a fifth-round selection in 2018 and WR Marcus Johnson: Bennett was arguably the best defensive end on the team in 2018, and was absolutely worth trading for. • Traded WR Torrey Smith to the Carolina Panthers in exchange for CB Daryl Worley: The team was going to cut Smith anyway, so trading him for a young corner with starting experience seemed at the time like a coup. However, Worley was arrested a month later, and subsequently released by the team. In 11 games (6 starts) with the Panthers, Smith had 17 catches for 190 yards and 2 TDs. • Traded a third-round pick for WR Golden Tate: The deal for Tate at the trade deadline for a third-round pick remains a bad use of resources. He was an eight-game rental (it ended up being a 10-game rental with some luck), and his production (37-342-2 in 10 games) fell short of expectations even after it was questionable deal in the first place. The Eagles only made five picks in this draft, but they managed to come away with some good players, and an additional second-round pick in 2019. • Round 2: TE Dallas Goedert: While his numbers (33-334-4) certainly weren't eye-popping because he didn't play as much as he should have, Goedert proved in his rookie season that he can get open and catch the football. However, the true pleasant surprise about Goedert's rookie season was his ability as a blocker, something he was not asked to do much of as the No. 1 passing game target at little South Dakota State. There were no obvious holes in Goedert's game, a rare thing to say about a rookie tight end, and he would already easily be a top half of the league starter on a team that didn't also employ Zach Ertz. • Round 4: DB Avonte Maddox: Maddox played slot corner, safety, and outside corner for the Eagles as a rookie in 2018, and did so impressively and confidently. He looks like he may have been a steal in the fourth round, and could compete for a starting job at any number of positions. His versatility will enable the Eagles to have all different kinds of options in the secondary, which makes him a potentially very valuable piece for the foreseeable future. • Round 4: DE Josh Sweat: Touted as a potential fourth-round steal by many a draftnik, Sweat had a disappointing setback, in my view. He is a developmental prospect with freakish athleticism but major injury concerns. An ankle injury suffered in December was serious enough to land Sweat on injured reserve, when the Eagles were already light on defensive end depth. The Eagles will continue to develop Sweat, but his injury during the 2018 season did nothing to quell those concerns. • Round 6: OL Matt Pryor: Prior is a massive human being with some athleticism. He had an excellent training camp, impressively taking on a lot of mental reps, playing both RG and RT. However, he struggled in the preseason games, and was on the team's inactive list for 17 or 18 games. Still, Pryor has plenty of upside, and has been groomed for a year in the Eagles' system. • Round 7: OT Jordan Mailata: Mailata's growth from the first day of training camp to the final preseason game was unlike anything I've ever seen in the NFL. He is a size-athleticism freak of nature with a high ceiling, but obviously, he is such an unpredictable study, seeing as the Eagles' first preseason game five months ago was his first game, ever. Like... ever. His career in Philly will be unpredictable, and fascinating to watch. A year ago, NFL.com analyst and former NFL scout Daniel Jeremiah stated that the Eagles have built the best scouting department in the NFL. That scouting department, led by Joe Douglas, was put to the test this year when they were forced to find players not on 53-man rosters to fill in due to an insane number of injuries. The silver lining to all the injury carnage is that the scouting department mined a few players who contributed in positive ways in 2018, and could continue to in 2019 and beyond. • CB Cre'Von LeBlanc: LeBlanc was an outstanding in-season addition who "really solidified the nickel spot," according to Jim Schwartz. He's a good tackler, he's quick, and most importantly to Schwartz, he's confident. He's going to be back on the team in 2019. • DT Treyvon Hester: Hester proved to be a great in-season addition as well, as he played very good run defense, and deflected Cody Parkey's game-winning field goal attempt, which double-doinked off the post and crossbar before falling harmlessly to the Soldier Field turf. He should be in a great position to earn a roster spot in 2019. • DE Daeshon Hall: Hall was added to the roster after Sweat went on IR, and in very limited action, he actually made a few plays, both with the regular defense and on special teams. He'll be in camp in 2019, and will have an opportunity to make the team. • Nick Foles stayed: The Eagles could have traded Foles, though we may never know what the best offer the Eagles received was. Obviously, the Eagles made a run to the playoffs, and even won a playoff game under Foles' leadership. • Guys who walked in free agency: The Eagles were right not to overpay to retain them. • Trades: Howie made fewer trades than normal. Bennett was a great addition, and Worley didn't really matter, frankly. While I can respect the idea of "keeping your foot on the gas," the Tate trade was terrible value. More trading this offseason please, Howie. I need fun things to write. • Draft: So far so good. • In-season pickups: Really well done. Impressive work by the scouting department. • Moves not made: Golf clap. #JimmySays: Obviously, Howie isn't going anywhere.